I grew up in the country. Our home was on a hill. The first window one looked out in the morning was the one with the view across a valley with the sun rising over the hill on the other side and a wide open sky above. Saw many sunrises out that window. Saw the beginning of many days – each one a little different from the day before. 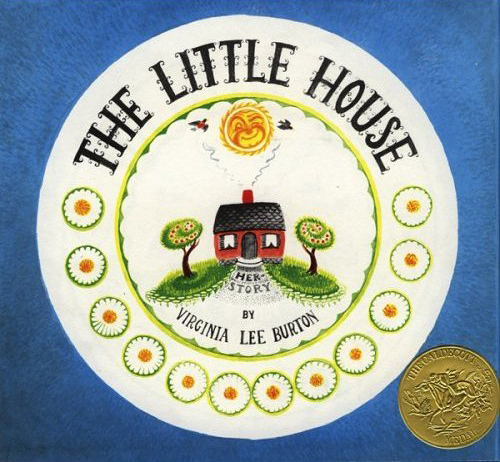 “The Little House” by Virginia Lee Burton was one of my favorite childhood books. I checked it out of the library often. That was many years ago. It came to mind this past week. The little house is a lot like me. I’m happier on the hill top than in the city canyons. I need to see the day. I love to see the sun rise. To see it set. To see what makes each day a little different from the day before. There was a week between houses – between the last phone call regarding the house I had been pursuing for the last 6 months and the house I’m in the process of buying. It was a busy week. I had to come to some new conclusions before the new house came on the market. On Sunday I saw a house that was “me”. There was hardly anything I would change. It was done very well and the layout was great. It was beautiful. And it had a view out the back of a natural area with a lake beyond. The room I would use as my studio, my work, would overlook the woods and lake. Except for the price, it was very appealing. It was also the house that convinced me of what it was I was really looking for. Interestingly, I came to realize I really didn’t want a house that was “me”, that had little I would change. It would be a bit awkward. How would I explain to clients I, their designer, lived and worked in a home designed by someone else? Would I have to give out another’s business cards? It confirmed that what I really needed, even wanted, despite the work and mess it would mean, was an ugly house – one I could do something with. And one the woodwork police would not get hysterical about when I painted the woodwork. That house was also in a “good” neighborhood (white talk for a white neighborhood). I’m in a “good” neighborhood now. What would be the point of moving? And why would I move there? Anyone could live there. I want to live where others will not. I concluded the house needed to be in Minneapolis’s Near North – a neighborhood I have yet to have a white person, other than my realtor, encourage me to move to. I want to be where I can learn of life through others. I want to be where my life can possibly be for good, to be in a Brian (from Louisiana) neighborhood, a place where there are kids struggling with things they need help struggling with, and against, and where the struggle is stacked against them. I’m not looking for a “good” neighborhood as much as a neighborhood it would be good to live in. I want to live good. I also concluded that I really needed a house to be where it had a view of nature, of a natural area like the one that house had – for my sanity. I realized that, for me, home is not just for being involved in other’s lives, it’s also a refuge, and a respite – a place to get away from helping others, from people. It’s also where I work in addition to where I live. What I see from it can be all I see on a given day. It’s “The Little House” in me. And it would be great to have a nature area for the kids I hope to help – kids feeling trapped, kids needing to get out of the city, kids who need a view. I chose the house I liked the best – the best-looking one, googled until I found the phone number, and called to see if they were interested in selling. The lady who answered seemed a bit annoyed with me, said no, and hung up. I ruled out that house. There were 5 other houses. One had just sold a couple months ago so I knew that one was out. I was down to 4 houses. Two of these looked to be multiple floor living – I was looking for one floor (Parkinsons). Down to 2 – one rather small one that was verging on ugly that was not my style, and one that looked to be nicer and big enough for one floor living. I decided that must be the house. I decided to talk to the owner in person rather than by phone. Need to get a haircut. The next morning, out of habit, I looked for new house listings on the MLS (Minneapolis Listing Service). It proved providential. There, on “my” block, was a little green monopoly-looking house icon with a “NEW” flag waving over it meaning there was a new house for sale on “my” block. It wasn’t there the night before – a few hours ago. Wow! It was so new there were not even photos posted yet. I had to go to the county records and google street maps to see which house this was. It was the little almost-ugly, not-my-style one. Then it was as if someone, a bit exasperated, whispered in my ear, “You goof, you WANT the ugly one”. I hadn’t even gotten my haircut. Having just reevaluated what I was looking for and having just done a city-wide search, the house that best fit my 60 plus list of needs/desires came up for sale – within hours. It was instantaneous if one only counts business hours. What were the chances of this happening? How often does a given house come up for sale? If one was to choose one house out of hundreds of thousands of houses to choose from, what are the chances that house would come up for sale the next morning? I didn’t even pray. It seemed redundant. What was there to pray about? Show me which house? I called my realtor. She had not seen it on the MLS yet. She was busy all day but was free after 6PM. We set it up to look at it then. I went to get a haircut. Met my realtor at the house. The house proved to be what I’ve been looking for – just had not fully realized what I was looking for until last night. It has a floorplan that works better than any house I’ve looked at. The living room is on the backside with views of nature. It has an entry that also leads to the lower level – a walkout – which will work great for having another(s) live with me. It’s small, but small means less cleaning, less maintenance. It has woodwork that has style and will look beautiful painted. It’s not the type the woodwork police get up in arms about. And it’s in need of a lot of work. It’s perfectly ugly in all the right ways. I noticed my realtor had a copy of the listing with photos. I asked if the photos were posted on the internet now? She said yes and then with a puzzled voice asked, “You didn’t see the photos? I said, “No.” She, knowing me, was a bit surprised I would want to see a house sight unseen. She didn’t know what I knew. As we were leaving, she said, “Look, you have a view of the skyline in the winter when the trees are bare.” Wow. Skyline view was on my list of desires but not a have-to-have. Now we’re into bonus stuff. I then went to check out the backyard. By the backyard I mean Wirth Park – Minneapolis’s largest park – almost as big as New York’s Central Park – 790 acres of woods, hills, creeks and lakes with every recreational activity possible. This home actually consists of two lots. It has a second lot behind it that adjoins Wirth Park – no roads or streets between. The second lot is woodland and goes to the bottom of the hill. The home sits on top of the hill overlooking nature. It is all one sees out the back which faces west – where the sun sets. As I walked around “my” backyard I kept getting distracted by the wildlife that did not seem very wild. Two deer kept a watchful eye. The ducks were dodging tree limbs as they explored the creek. The rabbits did their hopping thing. The creek, while not a lake, is a great feature of the park. It flows between ponds through a wooded valley with white pine. I knew this was it. And I knew I didn’t dare waste time. The most recent sale for a home on this block sold for asking price within days of hitting the market. Called my realtor the next day and said I wanted to buy it. Now to a realtor, especially to one who has seen me pursue a very elegant, classic home for the last 6 months, to see me switch to a house that is none of the things the other house is, and to decide, in what amounted to hours, to buy it, had to raise some questions as to just who it was she was working with (she’s a great realtor and I would highly recommend her, especially if looking in North Minneapolis. Call or write if you want her name). When I arrived at her office the next morning to formally make an offer on the home, she said she had bad news – the owner’s agent had already received another offer. Wow! I thought I was quick on this. She said I still had time to make an offer if I got it to the seller’s agent by 2 PM – the time the agent was meeting the owner to review the offer. I said let’s do it. Having another offer on the table changes how one goes about this. My offer could not be contingent on my house selling. Price had to beat the other offer – an offer with an undisclosed dollar amount. I asked how many chances I had to beat the other offer. One. I asked my agent what she thought I should offer. She said to be safe I probably needed to offer asking price. I thought a bit and concluded that if that was my realtor’s strategy, it would likely be the other realtor’s strategy also. The other party would be notified that there was another offer and would be given one chance to raise their original offer, also without knowing what the other offer was. I said lets go $1,500 over asking. I knew the asking price was over 30,000 less than the city’s assessed value which is typically less than market value so I felt there was some room to work. Yet, I didn’t want to pay any more than I needed to. I got it, but not by much and not until I had secured some family financial backing (my house has not yet sold). It’s the perfect little almost-ugly house …in the Near North …and from which one can see the sun set …day following day …each a little different from the day before. Wow! Can’t wait to seeit. Great story! I love how as you seek a house from which you can minister, the Lord gives you the desires of your heart! Thanks for sharing this story Tom, very encouraging to hear God as work in your move!